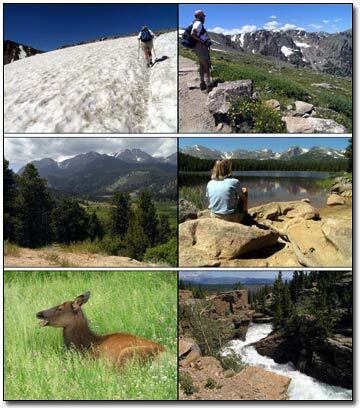 RMNP Hikes, Videos, Distance, Rating, Comments, Description, Elevation Gain & More. Of all the National Parks I've hiked in, Rocky Mountain National Park has the most variety of hikes... and something for everyone. I've passed an 81 year old man that had 2 hip replacements and 2 knee replacements. His comment "I'll still get there, but it will take me a lot longer!" I've passed someone who just recovered from brain surgery and had lost one eye. Her comment "It's great to be able to hike again!" I've passed people that were hiking up to 13,000' only to ski down the glaciers. And I met a 71 year old man that had already been to the top and was coming down from 12,700' (and I still had another half hour to the top). There is something for everyone (young and old)... easy hikes, 14,000'+ hikes, tundra, wildflowers, a huge assortment of wildlife, fast approaching thunderstorms and hail storms, fast moving glacier rapids, glacier hiking, boulder fields, serenity (being the only one on the trail for the whole day), private lakes, fabulous reflections, secret fishing spots, fabulous photography, technical climbs and much more. All climate zones and terrain can be experienced within one hike. There are few National Parks that can match the diversification of Rocky Mountain National Park. I have taken most of the hikes over the years and almost everyone can be one of my favorites for one reason or another. They all have their reasons for being a favorite only if I am just carrying my binoculars to go bird watching. Andrews Glacier: A tough but rewarding hike that leads you to a very private place as you see very few people along the trail. Flattop & Hallet Peak: A tough hike with grand views along the trail. You pass through 3 climate zones, wildflowers (if in season), tundra, tree line, forest, glacier, overlooks, boulders and much more. The Crater: A very private place that is not open until August. The hike is short but very steep and if you are lucky, you will see Big Horn Sheep. Mummy Range: The 3 mountains Chapin, Chiquita and Ypsilon form the mummy range. The hike is difficult but very rewarding. You will sometimes share the top of Chiquita with only the Marmots and no one else. Hope you have a great time hiking Rocky Mountain National Park.